Life’s Abundance Fish Oil is an ultra-concentrated, ultra-refined fish oil; tested for purity, quality and concentration. With hundreds of scientific studies substantiating the positive health benefits of Omega-3’s, fish oil is the smart choice for people who wish to lead healthier lives. * We use state-of-the-art processing to remove impurities and provide you with a fish oil supplement that is safe. Due to its superior quality and high concentration of nutrients, Life’s Abundance Fish Oil is an exceptional value compared to other market brands. Life’s Abundance Fish Oil is 100’s of times more pure and twice as potent as health food grade fish oils. On Tuesday, March 2, 2010, a lawsuit was filed in a San Francisco Superior Court, which alleged that several popular brands of fish oil supplements have illegally undisclosed and unnecessarily high levels of contamination from toxic PCB compounds. Widely regarded as cancer-causing agents, PCB’s were outlawed from manufacture in 1979. The lawsuit names eight manufacturers and retailers of fish and fish liver oils (as well as shark and shark liver oils) which tested positive for PCB contamination that exceeded the limits approved for human consumption. Our fish are harvested from the cold, pristine waters off the coasts of South America and Norway, where there are significantly fewer environmental impurities. Life’s Abundance Fish Oil is made from the fish body oil of sardines, anchovies and mackeral. These fish are small and low on the food chain so they contain less toxins. The fisheries are fully-sustainable and renewable resources. Our state-of-the-art molecular distillation refinement process concentrates the oil and removes environmental toxins without the use of harmful petrochemical products. Life’s Abundance Ultra Refined Fish Oil is highly purified so it is gentle on the digestive system. Most people will not experience mild gastric upsets often found with lower quality fish oils. Life’s Abundance Omega-3 Fish Oil Liquid is so pure that it is virtually tasteless. If you have been disappointed with the strong “fishy” taste and texture of other liquid fish oils, you will be absolutely delighted with the pleasant citrus flavor. Life’s Abundance Ultra Refined Fish Oil is also available in capsule form. When you select a fish oil supplement, it is very important to be able to check the quality and purity of the product. To demonstrate our commitment to quality and purity, we have Life’s Abundance Fish Oil scientifically analyzed and rated by IFOS (International Fish Oil Standards), an internationally-respected and non-affiliated third party. Life’s Abundance Ultra Refined Fish Oil has received an IFOS 5-Star, the highest possible rating for fish oil. Our dedication to quality ensures that Life’s Abundance is a safe and effective fish oil supplement for you, your family and your pets. Is Your Fish Oil Ultra Refined? Using the phase “Ultra Refined” means adhering to strict quality control standards never before reached with fish oils. Manufacturers of fish oil are required to test each batch they produce; however, in many cases, this testing is handled by the manufacturers themselves. Often testing is conducted prior to adding flavors and bottling, so the fish oil that is tested in-house may not necessarily be the same quality of fish oil delivered to the marketplace. Life’s Abundance Omega-3 Fish Oil is a true “Ultra Refined” fish oil. Unfortunately, our oceans are polluted and as a result, the fish used for oil contain toxins. That’s why it is necessary to ultra refine fish oil to remove these toxins. In addition to the standard manufacturer testing for every batch, we have enlisted the help of IFOS (International Fish Oil Standards), a non-affiliated third party and the internationally respected source for fish oil analysis. IFOS scientifically tests and analyzes the Life’s Abundance Fish Oil. This validation testing ensures that you are getting a safe and effective fish oil supplement that you can feel confident giving to your family. If you or someone you know is using a fish oil that is not tested by an independent laboratory for concentration, purity and stability, it’s buyer beware. Ask the manufacturer of that fish oil what it is trying to hide. It’s one thing to print pharmaceutical-grade on a label, it’s quite another to actually make a truly “ultra refined” fish oil. Life’s Abundance Fish Oil is manufactured to strict standards of purity. The combination of fish oil and the antioxidant properties of the sesame lignans is truly extraordinary. The sesame lignans help to suppress the natural oxidation process of the omega-3 fatty acids in fish oil, which actually enhances the fish oil’s health-promoting benefits. Each Life’s Abundance fish oil capsule contains 600 mg. of long-chain omega-3 fatty acids including 400 mg EPA and 200 mg DHA. This is double the amount found in health-food grade fish oil capsules. Four Life’s Abundance capsules would supply 2.4 grams of long-chain omega-3 fatty acids, which is similar to that found in one tablespoon of cod liver oil. One teaspoon of liquid Life’s Abundance fish oil contains 2.7 grams of long-chain omega-3 fatty acids. This is slightly more than one tablespoon of cod liver oil. This is equivalent to taking nine (9) capsules of typical health-food grade fish oil. Each teaspoon of Life’s Abundance contains 1800 mg. (1.8 g) of EPA and 900 mg. (0.9 g) of DHA. Life’s Abundance Fish Oil Is An Exceptional Value! Due to the superior quality, outstanding purity and higher concentration of nutrients in Life’s Abundance Fish Oil, it is an exceptional value compared to other market brands. To manufacture an IFOS 5 Star fish oil requires extensive purification. In fact, it takes 100 gallons of health-food grade fish oil to make one gallon of Life’s Abundance Fish Oil. Only this superior grade material makes high-dose supplementation possible due to lack of toxins and gastric distress common with other fish oils at recommended dose levels. Why Should You Take Life’s Abundance Fish Oil? It is recommended by the American Heart Association that healthy people protect their heart by consuming omega-3 fatty acids from plant and fish sources. Changes in food preferences and the impact of modern food processing in Western society have led to a significant decrease in average dietary intake of Omega-3 fatty acids. As a result, most American diets contain far more Omega-6’s than Omega-3’s. In fact, it is estimated that the average American has between twenty to fifty times the amount of Omega-6’s as they do Omega-3’s. Recent studies have indicated that this kind of imbalance can set the stage for a host of health problems. To promote a healthier fatty acid ratio, it is advisable to avoid Omega-6’s (which are commonly found in fried foods, commercial baked goods and some margarines), and eat more baked or broiled seafood and supplement the diet with a high-quality fish oil like Life’s Abundance Ultra Refined Fish Oil. Dr. Barry Sears, dedicated an entire book to the many benefits of long-chain omega-3 fatty acids contained in Ultra-Refined Fish Oils. He cites over 1,000 scientific references in his book, The OmegaRx Zone The Miracle of the New High-Dose Fish Oil. Fish oil is the richest source for eicosapentaenoic acid (EPA) and docosahexaenoic acid (DHA). Cold-water fish, like anchovies, salmon, sardines, tuna and herring, are considered the best source for these essential fatty acids. It is important to remember, that all omega-3’s are not created equal. You would need almost four tablespoons of flaxseed oil to get the same amount of EPA and DHA found in one teaspoon of Life’s Abundance! That’s approximately ten times as much flaxseed oil than fish oil. How Much Life’s Abundance Omega-3 Fish Oil Should You Take? A good maintenance dose is 2.5 grams of long-chain omega-3 fatty acids each day. This dosage represents either four SeaLogix capsules or one teaspoon of the Life’s Abundance liquid fish oil. This is the amount found in a tablespoon of cod liver oil. Individuals who will use the liquid are those who require higher amounts of long-chain omega-3 fatty acids or find taking the liquid easier than taking large numbers of capsules. The suggested usage for children 4 years of age and older is the same as adults. 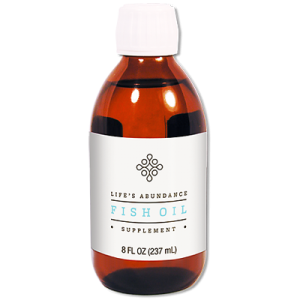 Life’s Abundance Liquid Fish Oil provides 2.7 grams of long chain omega-3 fatty acids including 1.8 grams EPA and 0.9 grams DHA. The bottle contains 8 oz. of fish oil concentrate and lasts for 45 days. If the usage is increased to one tablespoon per day each bottle will last for 15 days. The suggested usage for Life’s Abundance Capsules is 4 per day. This provides 2.4 grams of omega-3 fatty acids with 1600 mg of EPA and 800 mg of DHA. Each 1000 mg. capsule of pharmaceutical grade fish oil contains 600 mg of long chain omega-3 fatty acids including 400 mg EPA and 200 mg DHA. The bottle contains 120 capsules and will last for 30 days. All over the world, researchers are investigating the health effects of dietary fish oil consumption. This section of our web site is devoted to scientific research on the benefits of incorporating Omega-3 fatty acids from fish oil in your diet. We invite you to read these overviews of research studies and to draw your own conclusions about the potential advantages of taking high-quality fish oil supplements. We encourage you to visit our web site periodically to review updated reviews of studies and to learn of the newest evidence in support of taking Omega-3 fatty acids. Fish oil has shown positive benefits in helping pets with disease. Fatty acids are among the most commonly used nutritional supplements used in treating dogs and cats. Veterinarians first used omega-3 fatty acids in the form of fish oil to treat canine allergies but now recommend it for a wide variety of conditions ranging from kidney disease to arthritis and high cholesterol. Adding fish oil to your pet’s food provides anti-inflammatory effects and can help relieve itching and scratching an allergy-related skin conditions. If you are battling health problems with your pet such as allergies or cancer and you are looking for an alternative remedy, Life’s Abundance Omega 3 Fish Oil may be helpful. Learn how Fish Oil can help keep your dogs and cats healthy.